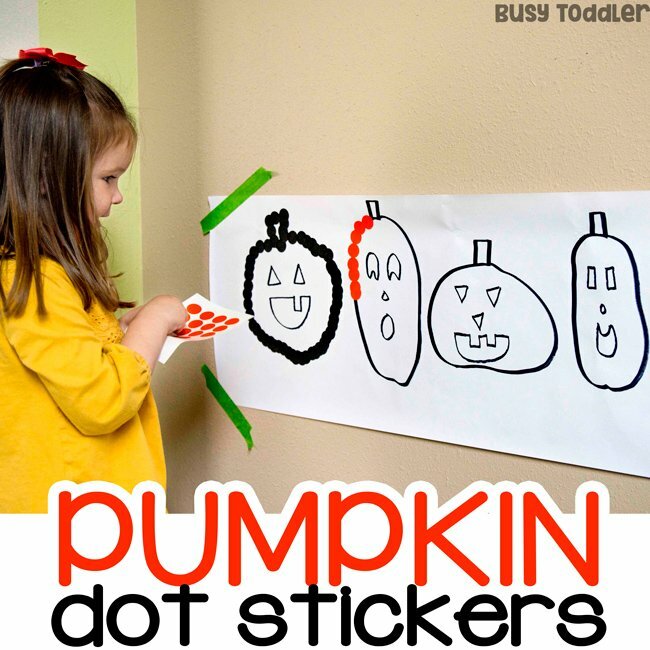 Inside: It’s time for some Halloween dot stickers – just what your morning needs! THEY MAKE HALLOWEEN DOT STICKERS? Oh yes they do! My dot sticker obsession just went up a notch. Who knew that was even possible?! They make black and orange packs, and I think I’ve lost my mind. Halloween dot stickers here we come! Dot stickers are the little loves of my activity life. I can’t stop using them – they’re so perfect! RELATED: Looking for more Halloween activities? 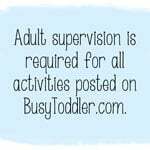 Check out my post “40+ Halloween Activities for Toddlers”. But finding them in “Halloween colors”…my stars! Spoiler alert: they do and I had the Amazon primed to my house ASAP. I couldn’t wait to get my hands on them! 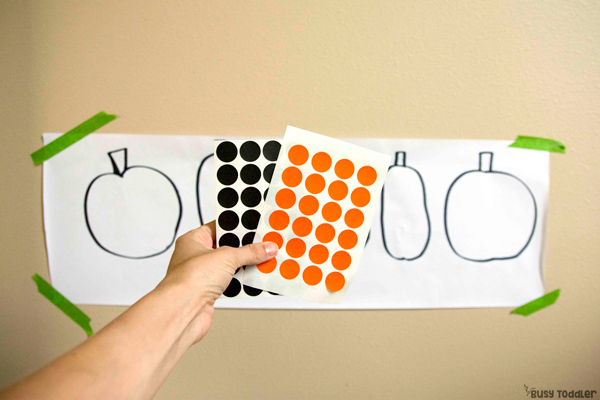 I knew right where I wanted to start with these stickers – a “5 Little Pumpkins” themed activity for my three-year-old who is obsessed with that book / poem. 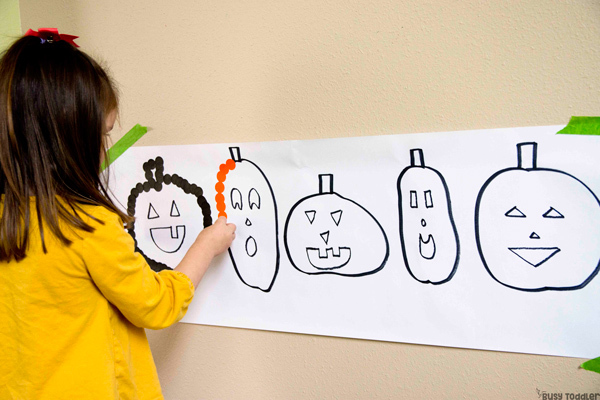 I rolled out my beloved white paper onto my wall and drew five little pumpkins. At first, I stopped there – pumpkins sounded perfect! 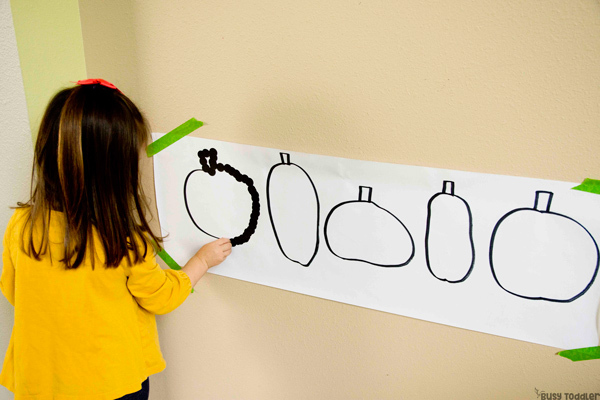 My daughter grabbed the dot stickers and started tracing around the first pumpkin. These needed to be Jack-O-Lanterns – not just regular pumpkins! So I grabbed my Sharpie and added faces…oh man! That really changed everything. My daughter went from excited to OVER THE MOON. 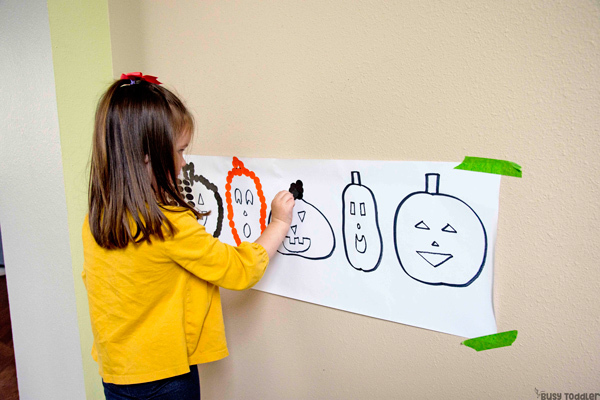 Adding the faces to these pumpkins made them come to life. RELATED: Looking for more Halloween books to add to your collection? Here are our favorites! What’s my daughter working on here? She’s actually doing a lot with these little pumpkins. 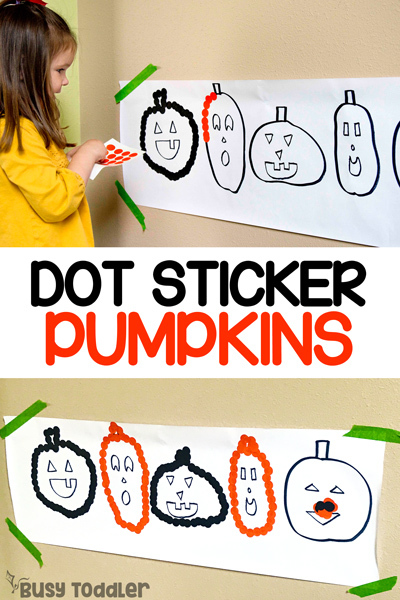 This was the perfect activity for my daughter – who loves dot stickers and pumpkins equally. 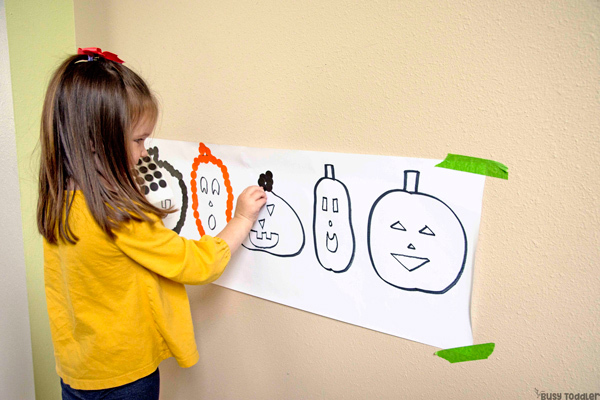 It’s an easy way to get into the Halloween spirit with a couple sheets of dot stickers and some hand drawn pumpkins. Finding those Halloween dot stickers has been an October game-changer for me. 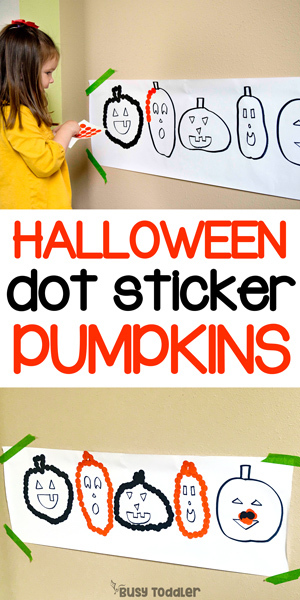 I can’t wait to make all the Halloween dot sticker activities now! 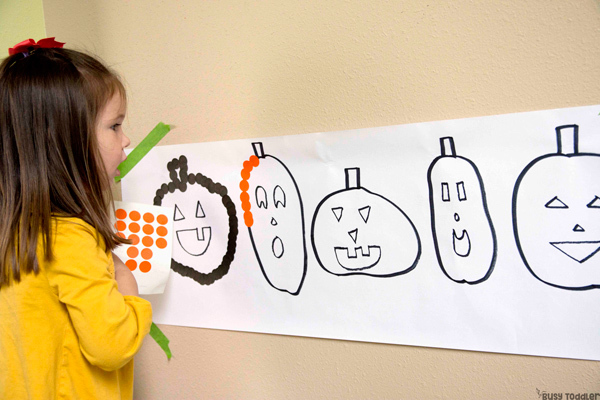 When will you pick up from Halloween dot stickers? 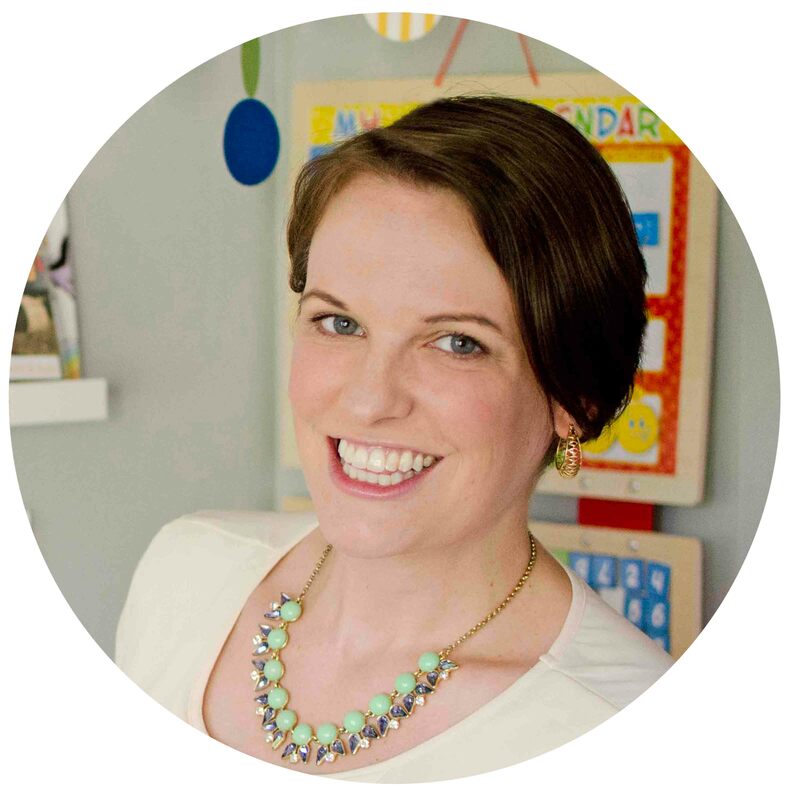 « What does Potty Training look like?